Some funny plans would not just stop trooping in as usual. Few days ago, it was the Glo Jollof plan that surfaced and it was kind of funny though, considering the facts that the Glo Jollof plan may be linked to Jollof rice or whatever. Two days ago, Airtel unveiled yet another competitive plan and they call it "WTF." Literally, the internet lingo has this meaning "What Tha Fu*k," But in Airtel's term, they rather prefer naming it the "Whatsapp,Twitter,Facebook and BBM plan. This plan goes for a paltry price of N200 for a monthly subscription and this is so interesting. I am yet to confirm if this plan will actually work unlimited for these application as the Whatsapp unlimited monthly access or Airtel has it linked to a data cap. Considering the improved speed of the Airtel network for some days now, one would not have any hassle considering the effectiveness of this plan, more especially for the Andriod users. Now there is a trick i normally do for my clients, and this involves " Subscribing them to the unlimited Whatsapp, Operamini plan and adding up little BBM subscription. That used to cost more in the past. Now i had to reconsider somethings included in the Airtel WTF plan and i noticed that one can actually surf the internet at a much cheaper rate via the use of the Airtel WTF. Now this is my trick. This what i do to put behind all my browsing problems. 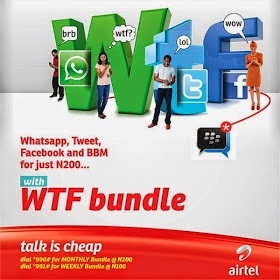 I purchase the Airtel WTF bundle plan for the price of N200 and get access to monthly ccess to Whatsapp, Twitter, Facebook and BBM. Now lets reason together, there is something lacking in this plan and that is the fact that i may not be able to browse the internet to check Goals.com and other interesting packages or website i visit on daily basis. In my verge to combat this menace, i subscribe to the operamini plan of N300 which i am entitled to a data plan of 300MB. You see, with a total of N500, i get uninterrupted data access on Airtel network. So Andriod users still have hope of browsing the internet at a cheaper rate on the Airtel network. To subscribe to the Airtel Whatsapp,Twitter,Facebook or BBM, simply recharge N200 or above on your mobile device and dial *990# from your device. Now you can blend this plan simultaneously with the Airtel Operamini plan by dialing *885*1# upon successful recharge of #300. To check data balance use *885*0#.This will give you access to the Operamini plan. Well also introduces similar kinda bundle and I hate it.